There was a small hiccup with the domain registration over the weekend. But now the blog is back. And due to a number of requests, there will probably be some changes soon, and my magnificent (but slightly unpopular due to its placement) logo will be moved around in some way. I had cause to visit the toilets in Starbucks the other evening. I have to admit, that I had planned to put something more than toilet roll down the toilet, so I was a bit stumped by this. 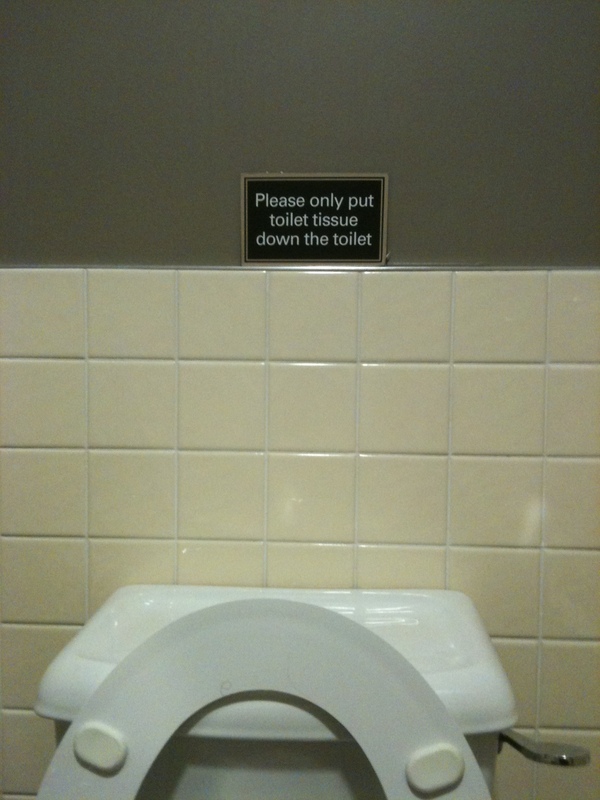 Should I ignore the sign, or obey and just hold it in? 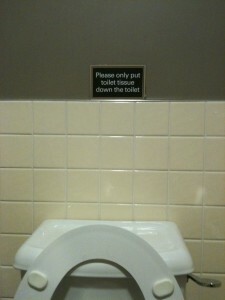 I have to admit, I ignored the sign, and went in the toilet, as I usually do. But the worst part of the story is that there wasn’t even any toilet roll there, which meant you couldn’t put anything in the toilet! So what was it there for? Perhaps it’s an art installation of some sort. Or maybe just for washing your face in. Who knows! We’re used to the pace of technology these days, with constant improvements in mobile phones and the like meaning that anything more than a few years old is unusual because it’s so out of date. But some areas of life don’t seem to change so often. Or so you’d think. Recently the toilets in my office got a bit of refit, so we now have the 3rd set of toilet roll dispensers in 11 years. These ones look like large white eggs stuck onto the cubical wall, and they dispense pre-cut pieces of toilet paper (an actual roll is apparently so last decade). I had no idea that toilet roll technology moved so quickly! We also have an exciting new soap dispenser, to go with the 5 signs that tell us to wash our hands. I can hardly wait to see where bathroom technology will take us in the future! You are currently browsing the Destroy All Onions! blog archives for February, 2010.